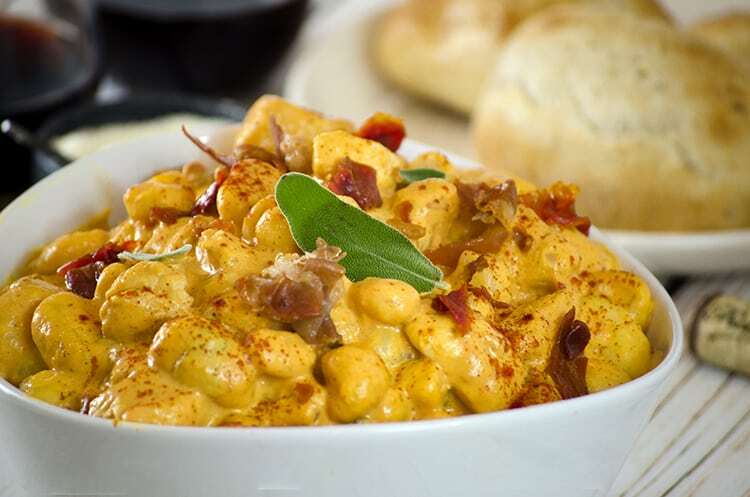 This pumpkin gnocchi recipe has to be one of the most delicious pumpkin recipes on the planet. Even better, it’s fast, cheap and simple to make. Read on and be sure to have a drool cloth handy. 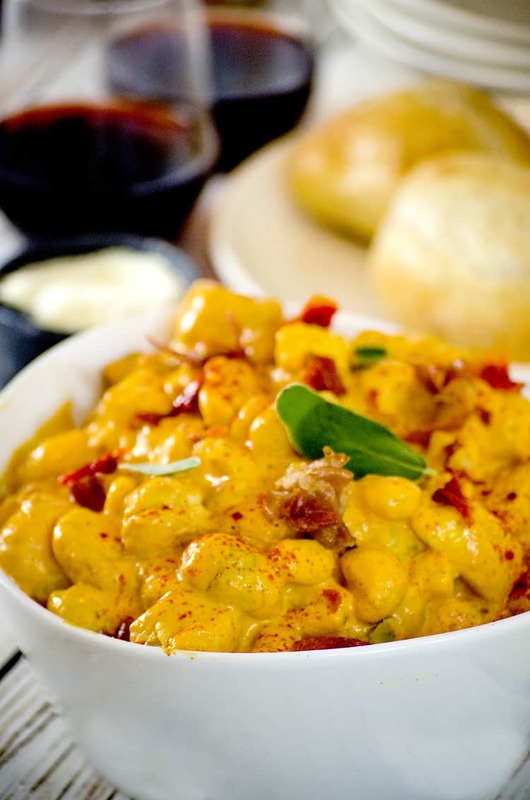 Pumpkin Gnocchi Recipe from Platter Talk. Our pumpkin gnocchi recipe is part of #pumpkinweek, where almost 40 food blogs dedicate an entire week to foods featuring the great pumpkin! My love for pumpkins started on a rural dairy farm in upstate New York where I grew up and had a bird’s eye view of my mom’s huge garden from my second-floor bedroom window. My favorite section was the pumpkin patch, and as soon as I was old enough, I took over that part of her garden and began my quest of growing the biggest and most beautiful pumpkins around those parts. 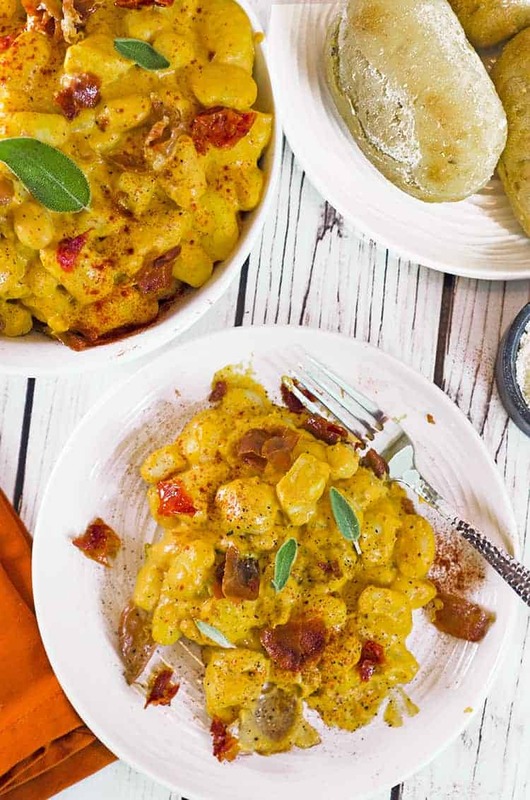 This savory pumpkin gnocchi recipe goes together in just 30 minutes. This relationship with pumpkins has carried over to my adult life and even over to our food blog. You can read All About Pumpkins from our own Chef Kat and learn more. We chose this savory fall meal to kick off Pumpkin Week because it’s simple, fast, and inexpensive. Most of all, it’s creamy and delicious! At about $2.00 per serving, this gnocchi recipe is perfect for cooking on a budget. 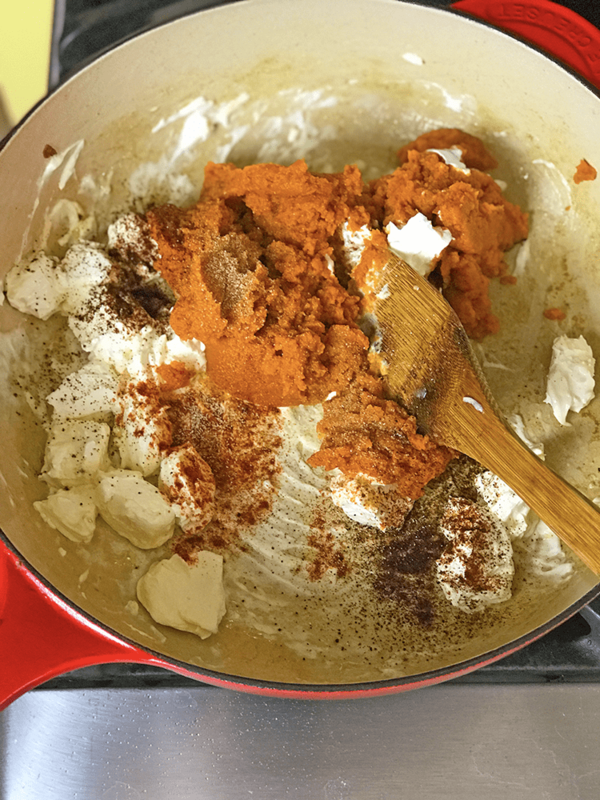 What’s in this Pumpkin Gnocchi Recipe? Boil the gnocchi as directed on the package. We took the easy road and picked up a couple of pounds of store-bought gnocchi. It only takes a couple of minutes to boil so have a colander ready to drain it. Once it’s finished cooking, coat it with some olive oil and gently stir it up. The olive oil helps to prevent it from sticking while you put the rest of this easy recipe together. We’ve featured homemade gnocchi in the past, it takes a bit more time to make but it is super fun to put together and a fun cooking activity! Slice the prosciutto before placing in a hot skillet. Use a large skillet to fry the prosciutto. 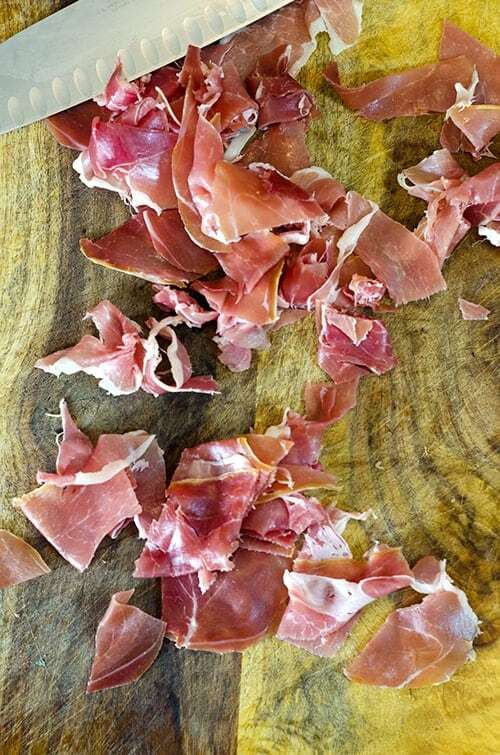 Prosciutto is a thin, almost feathery, Italian ham. It is delicate, with a salty and savory taste. Chopping it up and then frying it down to bite-size crisps takes this savory gnocchi recipe to a new level. If you like, substitute the prosciutto for pancetta (Italian bacon) or regular bacon that is fried and crumbled. 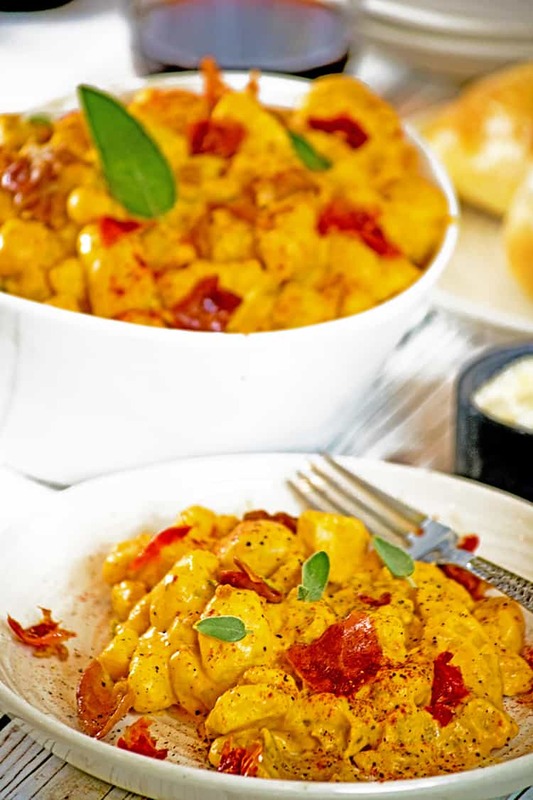 Chicken breast adds some good protein to this pumpkin gnocchi recipe. This pumpkin gnocchi recipe uses a diced chicken breast that you will want to brown over medium-high heat until cooked through, again about five minutes. Use the same big skillet from the previous step and add a little bit of olive oil to help keep the chicken from sticking. 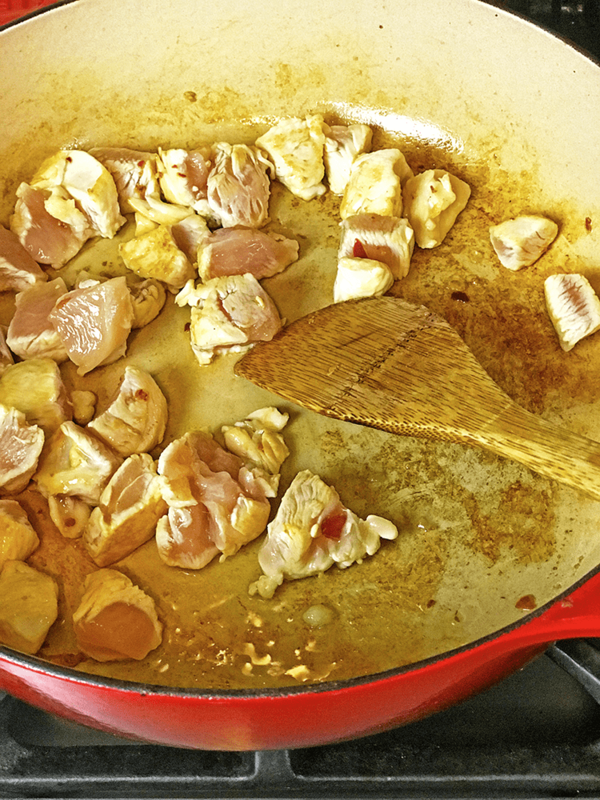 When the chicken is cooked through, take it out of the skillet and set it aside. 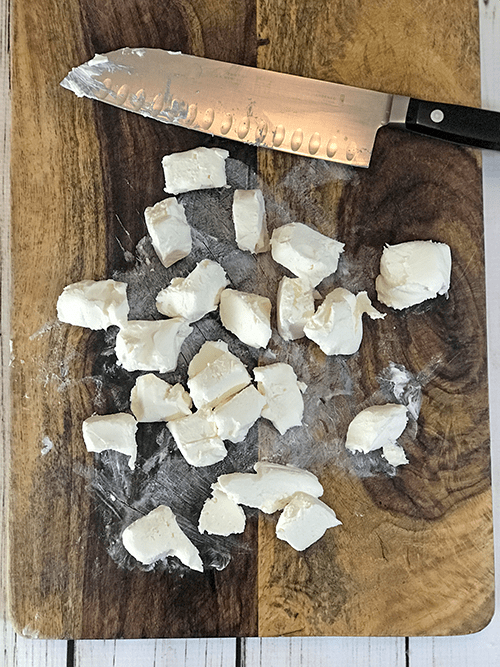 Cut 8 oz of cream cheese into cubes to start this gnocchi sauce. 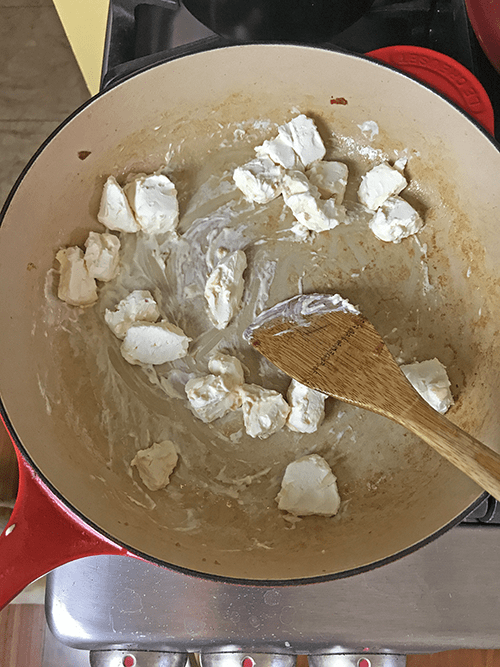 Start this gnocchi sauce by melting the cream cheese in a large skillet. Like many good sauces, this gnocchi recipe has a couple of different cheeses in it. 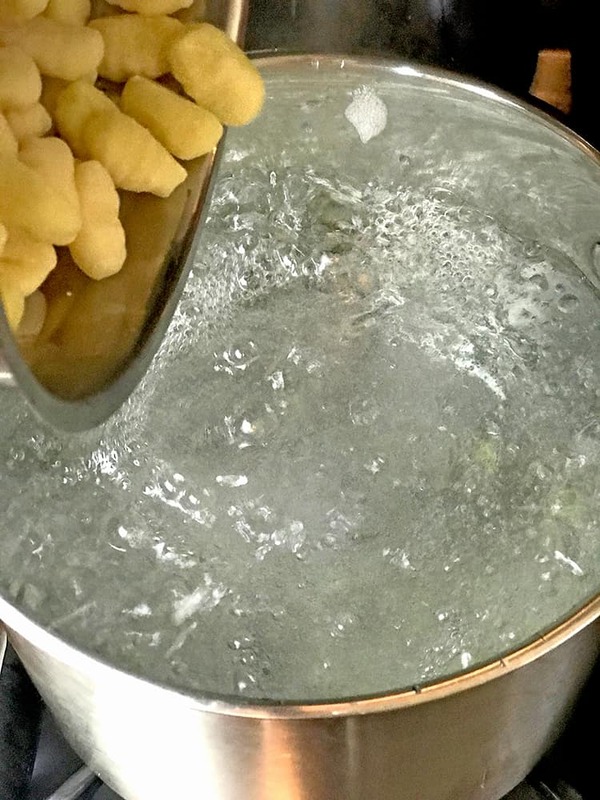 To make the gnocchi sauce, start by melting 8 oz. of cream cheese. As with all recipes, don’t skimp on the quality of your ingredients. 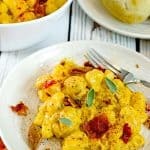 Use the best cream cheese you can find as it is the base of this savory and creamy gnocchi sauce. 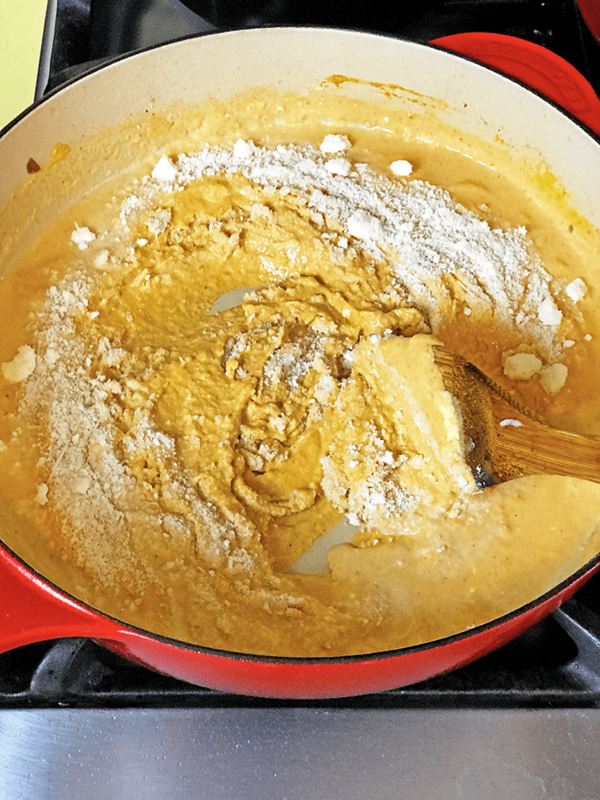 Stir in the pumpkin purée, season and spices. Milk (or cream) is added to the mixture. 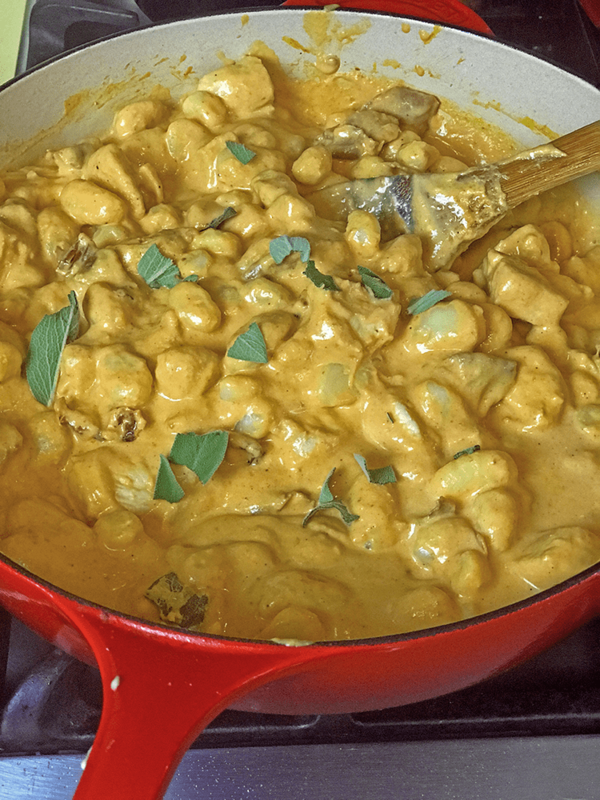 Here is when things start to get yummy, with this pumpkin gnocchi sauce. 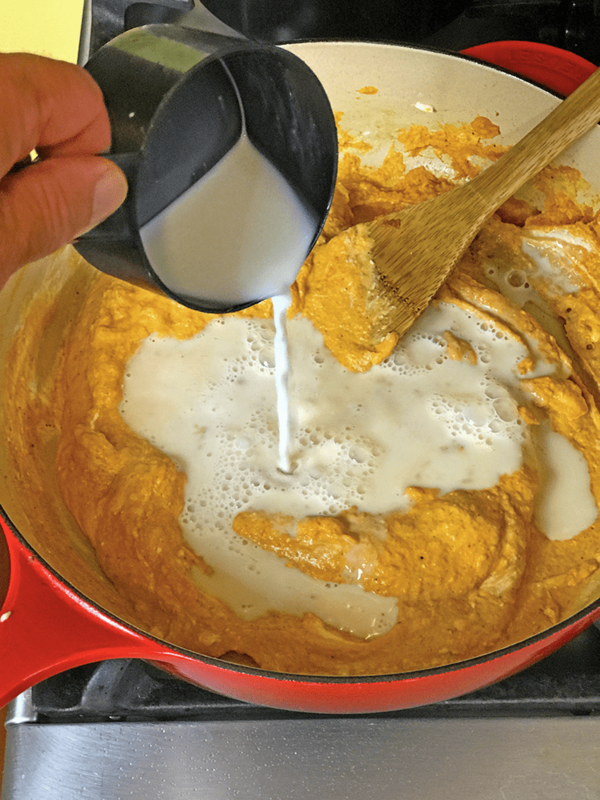 Continue stirring the skillet over medium heat and add the pumpkin purée and spices to the cream cheese. Stir in some savory Parmesan cheese to the gnocchi sauce. Return the chicken and the cooked gnocchi to the gnocchi sauce. Continue to stir the gnocchi mixture over medium heat. It will begin to thicken and if you need to thin it out a bit, slowly stir in more milk (or cream). 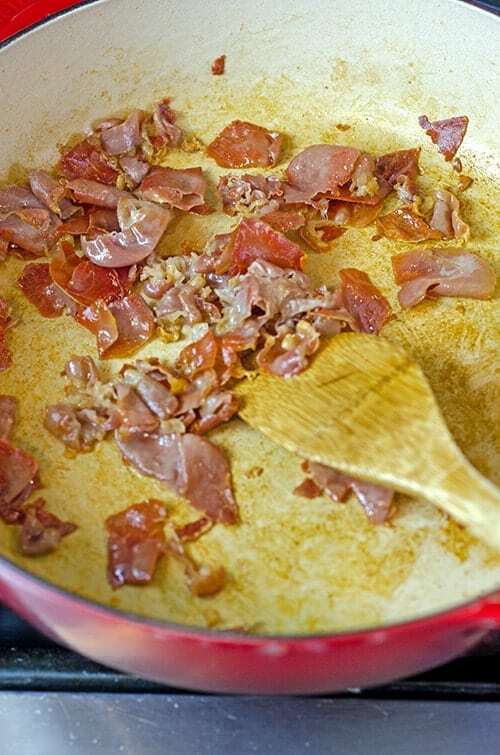 Add the crispy prosciutto and sun-dried tomatoes to the skillet. 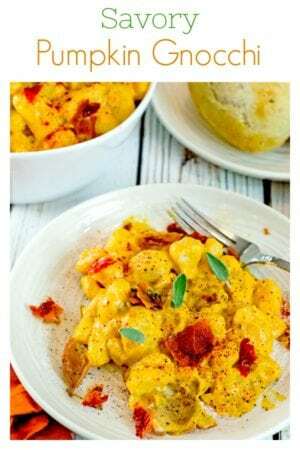 The crispy prosciutto and sun-dried tomatoes each add a savory flavor to this pumpkin gnocchi; this masterpiece meal is almost ready to serve! Garnish this pumpkin gnocchi with fresh sage. Tear up a few leaves of fresh sage and add them to the gnocchi. You’re going to love this savory combination! Make this savory gnocchi recipe for about $2.00 per serving. This gnocchi recipe is not just delicious and beautiful; you can make it for just a couple of dollars per serving. It reheats well. This is best done using a small pan, add some milk to thin out the gnocchi sauce if necessary. I think some toasted walnuts would make a great addition to this gnocchi recipe. For added color, flavor and health, add some baby spinach to the pot, at the end of the recipe. You can either use whole milk or cream for this gnocchi recipe. Some things just weren’t made for skim milk! This savory fall meal is perfect for entertaining while not breaking the bank. Using a cheese-based gnocchi sauce, you can put this dinner together in just 30 minutes! Prepare gnocchi as directed on package. Or, make your own homemade gnocchi recipe here. Drain and toss in olive oil to keep from sticking. While waiting for the water to boil for the gnocchi, chop prosciutto on a cutting board. Then, heat 1 tbsp olive oil over median-high heat, in a large skillet. Fry the prosciutto down until crispy. This takes about five minutes, be sure to stir it frequently using a large wooden spoon. Remove crisped prosciutto and set aside for later. Cube chicken into 1/2 inch pieces. Use the same large skillet from the prosciutto and heat 1 tbsp olive oil over medium-high heat. Brown the chicken and cook until done, about five minutes. Remove and set aside. Cube the cream cheese, then place in the same large skillet over medium heat. Stir until it begins to melt. Then, add pumpkin, paprika, and chili powder. Stir in the milk and then add the Parmesan cheese. 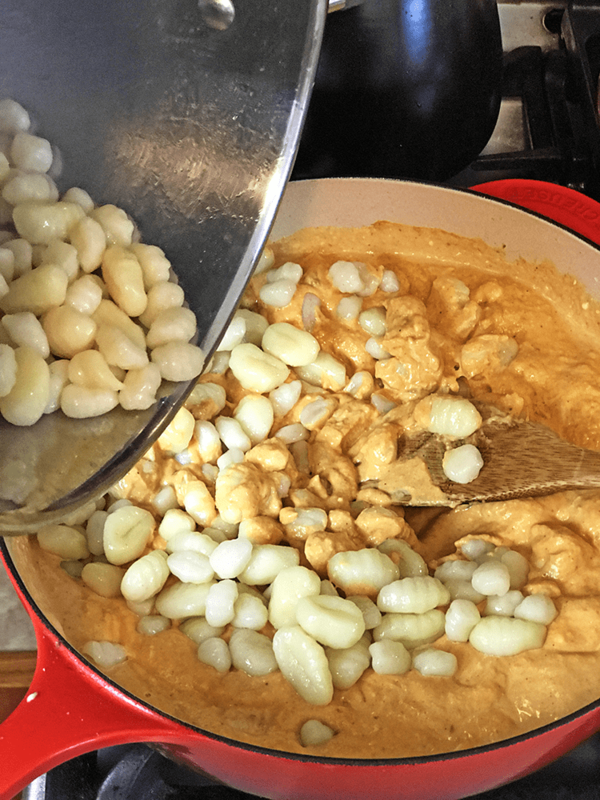 As the gnocchi sauce cooks, it may start to thicken. Add more milk (or cream) if necessary. Return the cooked gnocchi and the chicken to the gnocchi sauce while continuing to stir. Add crisped prosciutto and sun-dried tomatoes, while stirring. Stir in sage leaves and salt and pepper to taste. Serve immediately. Substitute fried and crumbled bacon for prosciutto if you like. 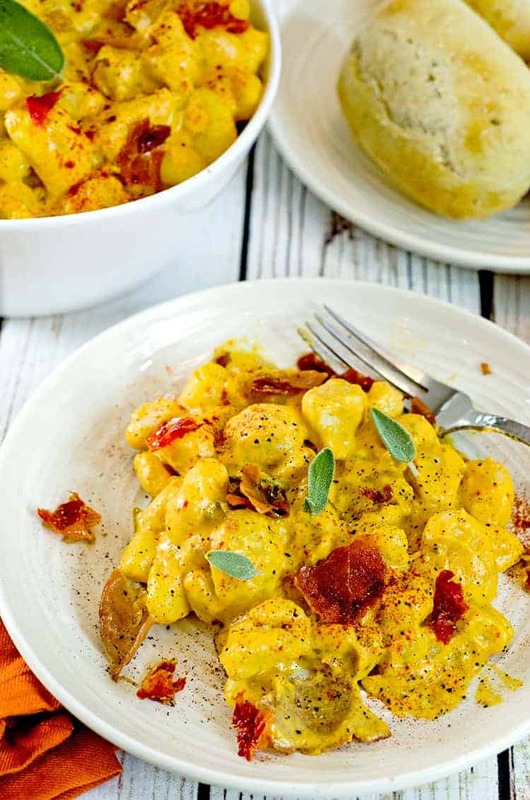 Pin this Savory Pumpkin Gnocchi Recipe for Later. Thank you PumpkinWeek Sponsors: Dixie Crystals, Cabot Cheese, and Eggland’s Best for providing the prizes free of charge. These companies also provided the bloggers with samples and product to use for PumpkinWeek recipes. All opinions are my own. This is such a great idea! Looks so yummy! 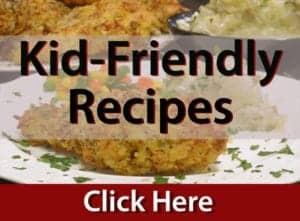 This recipe has it all! 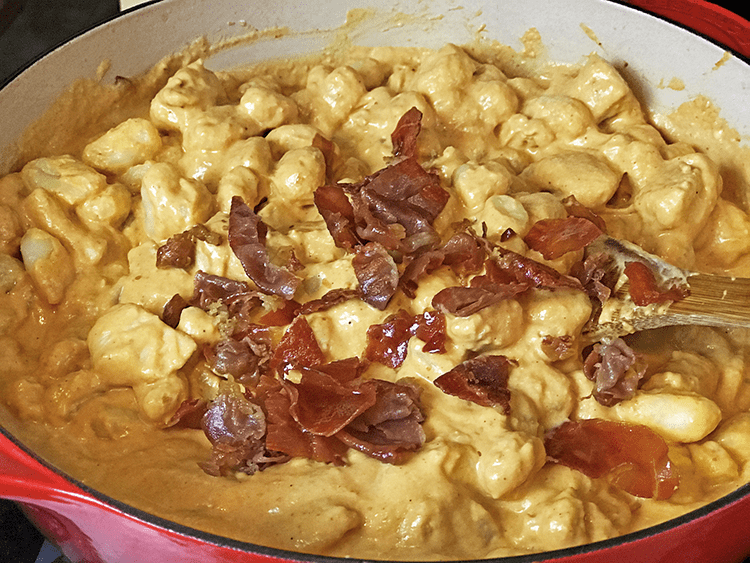 Creamy, cheesy, smoky, comforting…I want it, that’s all I can say. 🙂 For me, it’s a tossup between sweet and savory pumpkin dishes. I love them all. Some decisions are harder than others, Dorothy! I think though, that given your choices, you can’t go wrong with any of them! This looks absolutely drool-worthy as you said! I love prosciutto and sage in here! Thanks, Barrie. I am actually still drooling at the memory of this one. My mouth is absolutely watering! 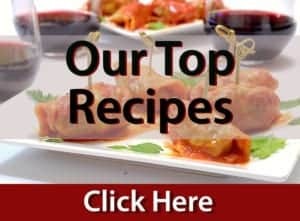 I really love gnocchi and of course, being low carb we don’t have it like we used to. It’s a great treat though and I’m stashing this away for one of our treat meals to enjoy this fall! Thanks, Shelby! This is one of the best tasting fall recipes we have made this year; I hope your autumn is delicious! Oh man! This looks amazing! I need to get on this one. All of the ingredients were destined for each other! Wow these look fantastic for Fall! And love all the helpful step-by-step photos guys! Thanks, Diane. This gnocchi recipe is a must try! A delicious, quick and easy weeknight dinner.